After several months of no spinning, I’m back with a vengeance. And before I’m allowed to spin any new singles, I’ve tasked myself with plying the singles I’ve already spun. I need to free up some bobbins. Perhaps not the most artistically inspiring mission statement. But sometimes pretty things spring from necessity. 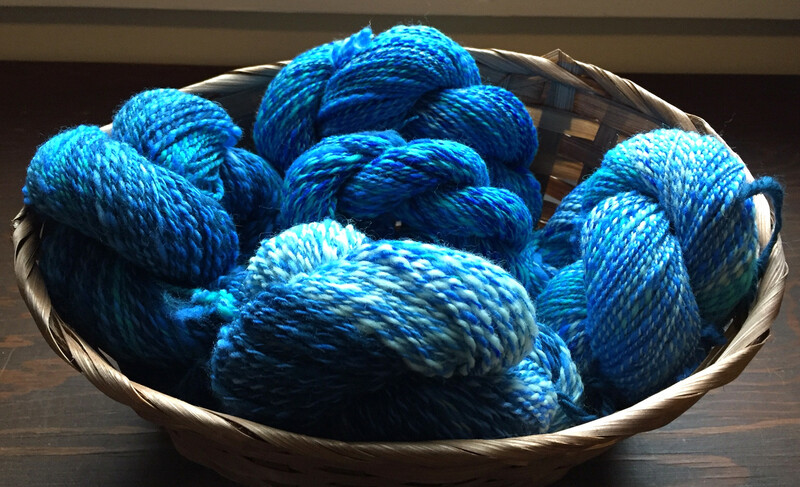 First came this 2-ply blue merino. 886 yards. One strand of tonal blue. One strand of a more variegated fiber in ocean colors. Next came this rainbow Corriedale from Gale’s Art. I spun these fine singles for a class last summer, then never used them. I split the roving into thin strips so I would have lots of short color repeats. I spun the singles chain-ply to retain the stripes. 606 yards.It looks vaguely Koigu-ish. 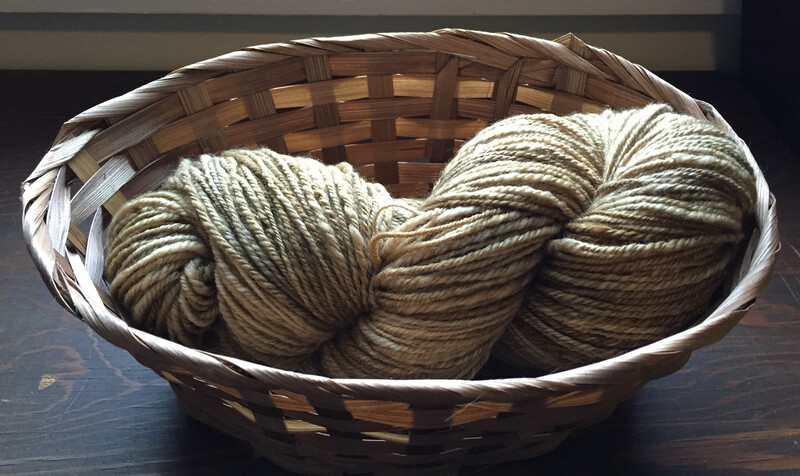 Last of all came this golden brown BFL/silk. The singles had been sitting on the bobbin for a long time waiting for inspiration to strike. But I’d never been able to find something else appropriate to ply with them. So I decided the best thing to do was to ply them with themselves (chain ply) and move on. Q – Absolutely beautiful! A wonderful knitter and a wonderful spinner. Wow! I really like those blues. What are you thinking you’ll knit with it? You really inspire me to take up spinning. I love the blue yarn you made! Excellent work. Sometimes taking a break from spinning helps your spinning. 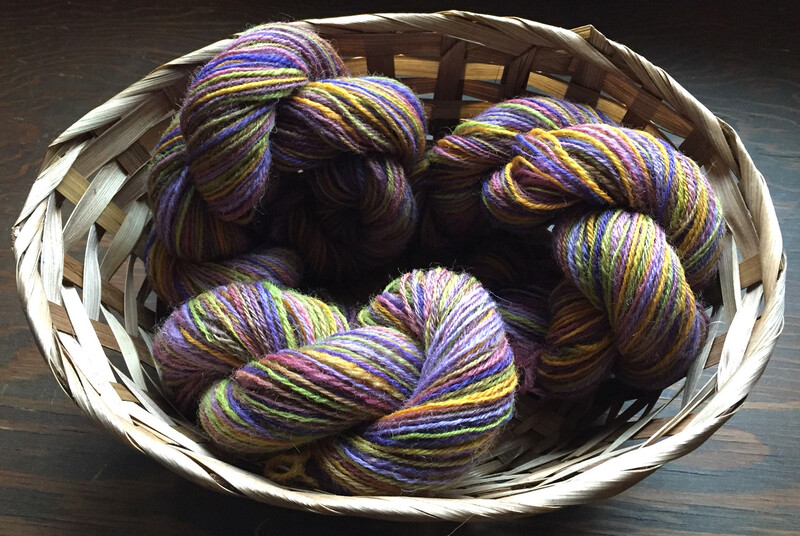 I hadn’t spun in some time but got reinspired right before January Spin-In. I was amazed at how much my spinning had improved. Ii spun almost a whole bobbin of sport weight alpaca singles during spin-in. Now is I can just keep the momentum going…..
…All of which are utterly beautiful, so I’m struggling to know what to say in my comment. But I just wanted to drop by and admire your home-spun loveliness. I tried spinning once and found it so relaxing. 🙂 Love those blues!!! Beautiful! And quite disciplined. An encouragement. Thanks. All very pretty, but I especially love the blue! Yeah the blue color combo turned out really well.